Oscar-winning director Sharmeen Obaid-Chinoy's STUDENT ATHLETE is a look at the multi-billion dollar college sports industry from the position of the students who don't get paid, and are taken advantage of by the school who rake in boat loads of money. A good primer on the really bad situation, many students live below the poverty level and the alluded to stepping stone to the pros really isn't there, since almost 100,000 people play college athletics but only just over 300 people made it to the NBA or NFL. This is a film that will piss you off big time. On the other hand if you've seen any of the spate of inde films about the abuse of student athletes (such as Bob DeMars's THE BUSINESS OF AMATEURS) you'll have seen much of what is covered before. That isn't to say that STUDENT ATHLETE is bad, it's not, it's simply that if you've seen other docs you know what you are going to get. What is important to note that while I have seen several other similar films, all of them played on the festival circuit or played small independent theaters where not a lot of eyes could see them. 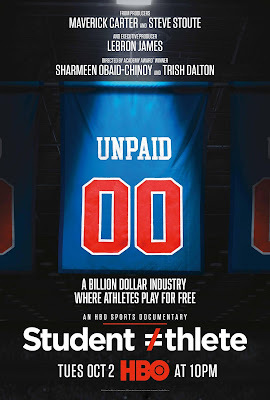 The fact that STUDENT ATHLETE is on HBO makes it vitally important because it is the first time many people will really be made aware of how the colleges are taking advantage of their students. to that end if you've never seen anything on the crisis- see this film.